1022 Cole Avenue looms at back as Chaplin surveys construction of the department store set for his first Mutual production The Floorwalker (1916). Marc Wanamaker – Bison Archives. The sturdy two-story home once located at 1022 Cole Avenue had a front row seat to some of the most remarkable scenes in early Hollywood history. Its rear dormer window looked down on the humble open air stage where Charlie Chaplin filmed his 12 Mutual comedy short films in 1916-1917, and where Buster Keaton later made his independently produced short and feature films (1920-1928). Moreover, the home appears peeking over the studio fence in many early scenes. One can only imagine the cinematic activity this home witnessed before it was demolished in 1929 to make way for the Technicolor Building, itself a landmark of Hollywood history, and now a Gold’s Gym. This aerial view, likely taken March 7, 1921, shows the home relative to the open air stage that Keaton would close over later that year. Remnants of the Convict 13 prison guard tower set, discussed further below, can be seen in the far corner. The white wall near the prison set is Buster’s ‘WANTED’ poster appearing in The Goat. The Metro Studio front office buildings appear at top. HollywoodPhotographs.com. 1022 Cole, similar views – The Boat (left) – newly restored from The Blacksmith (right). 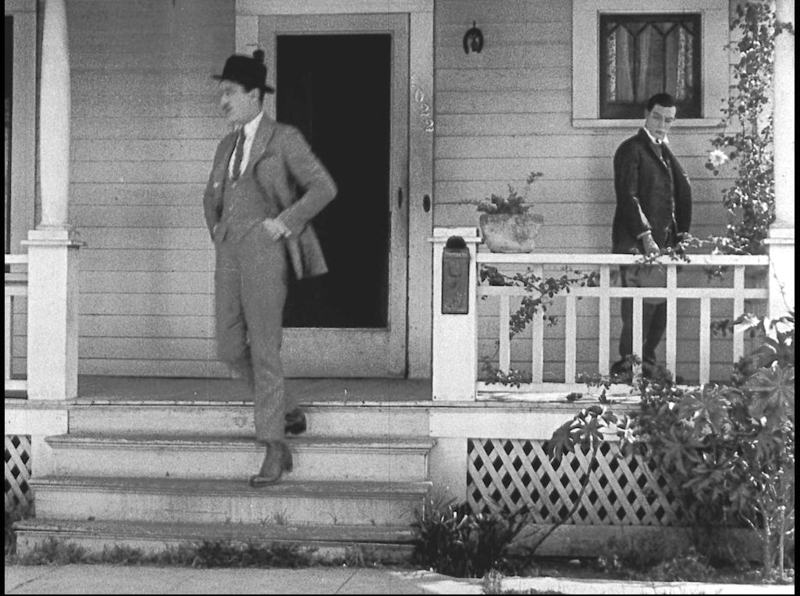 Since Buster filmed more frequently than Charlie on the studio backlot, the home makes several cameo appearances in Keaton’s early short films. Above the home stands watch over The Boat (1921), as Buster and family realize that towing a boat through a too-narrow basement doorway has just destroyed their domicile. The Cole home also appears in some of the remarkably restored Lobster Films footage from The Blacksmith (1922) newly released by Kino-Lorber. 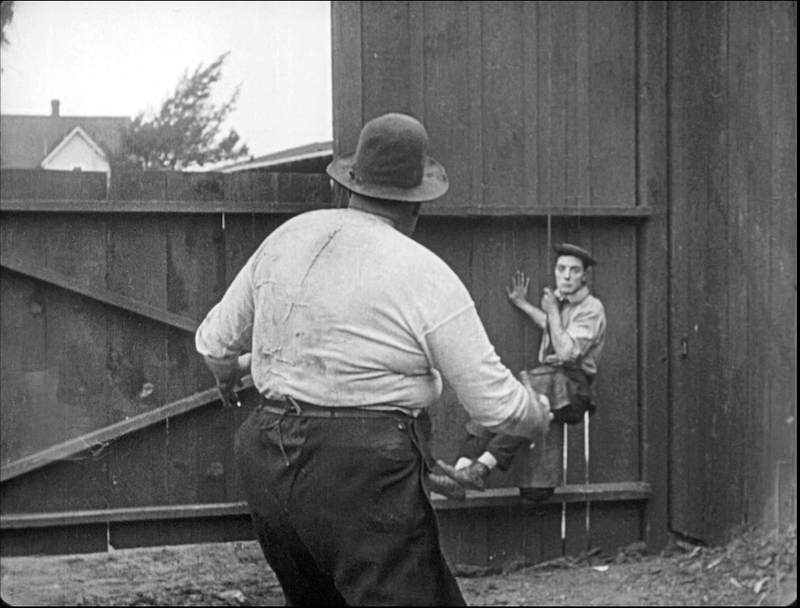 The home first appears over the fence in these scenes with Buster and Big Joe Roberts filmed inside the studio gate on Cahuenga, above and at left. Click to enlarge – 1022 Cole (box) and upper right during the opening and closing scenes from Day Dreams. 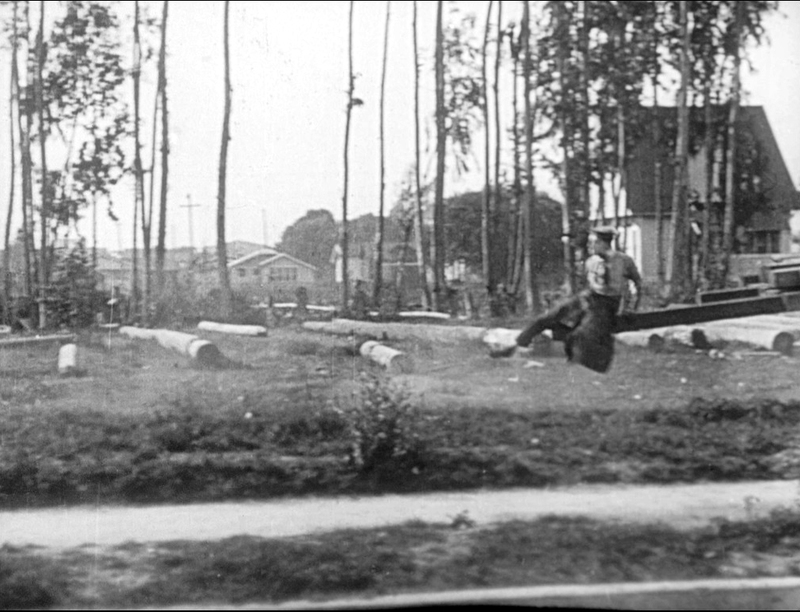 Although fairly obscured by a fake garden fence, the home also appears during the opening and closing scenes from Day Dreams (1922) shown above, purportedly looking from Reneé Adorée’s front porch, as Buster dodges a car when first greeting her, and again during his return home, via parcel post, following his failure to strike it rich in the big city. 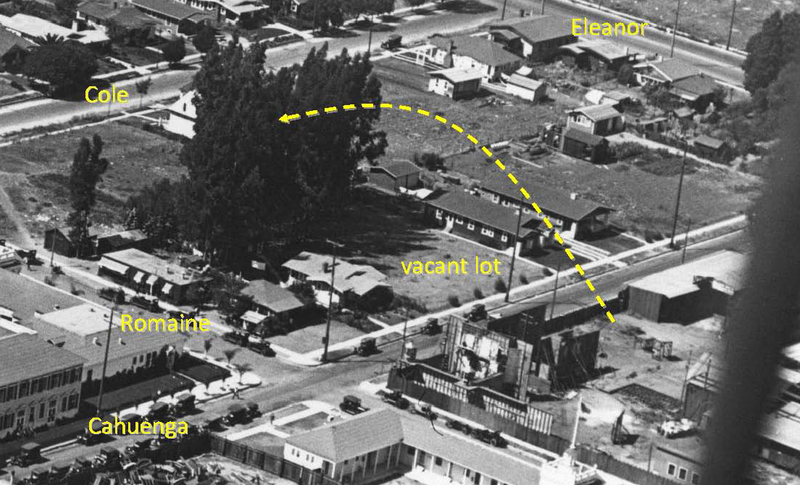 The arrow in this circa 1920 photo marks where Renee’s house would later be built for Day Dreams in 1922, facing a small vacant lot across the street, behind which stood 1022 Cole. HollywoodPhotographs.com. 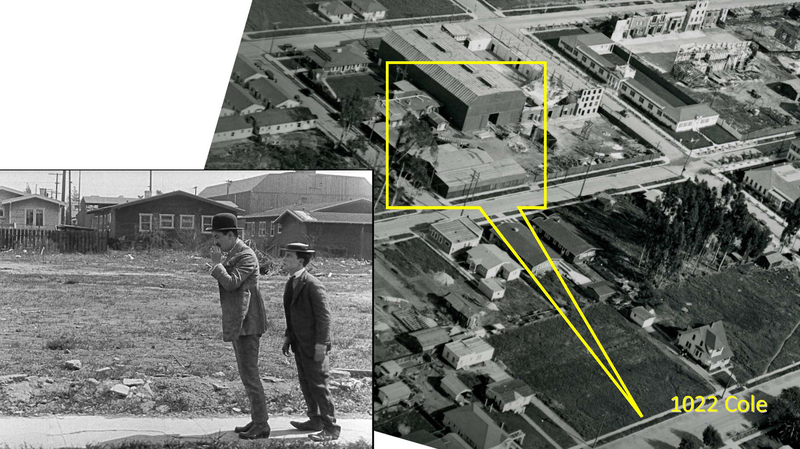 Chaplin and Keaton built their biggest sets in the empty backlot corner at Romaine and Cahuenga pictured at right above. Chaplin built the “T”-shaped tenement set for Easy Street (1917) at this corner, and likely built the fountain and spa exterior set from The Cure (1917) there as well. 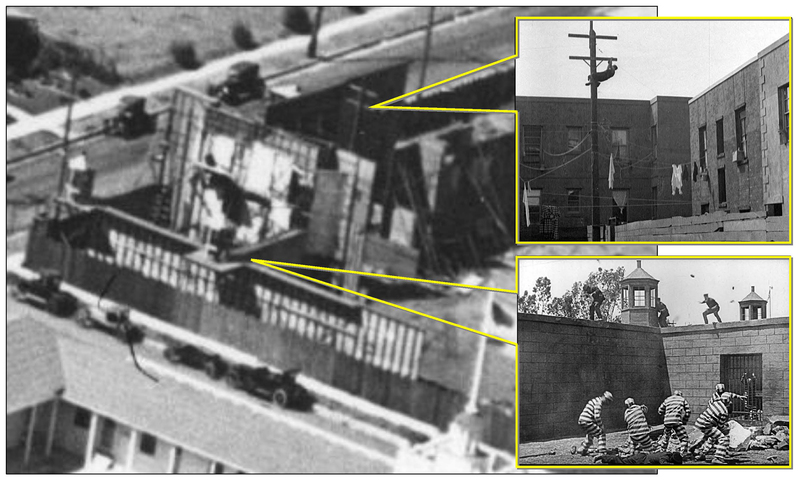 As explained further below, the above view shows both the prison set from Buster’s Convict 13 (1920), and Buster’s similarly configured tenement set from Neighbors (1920). 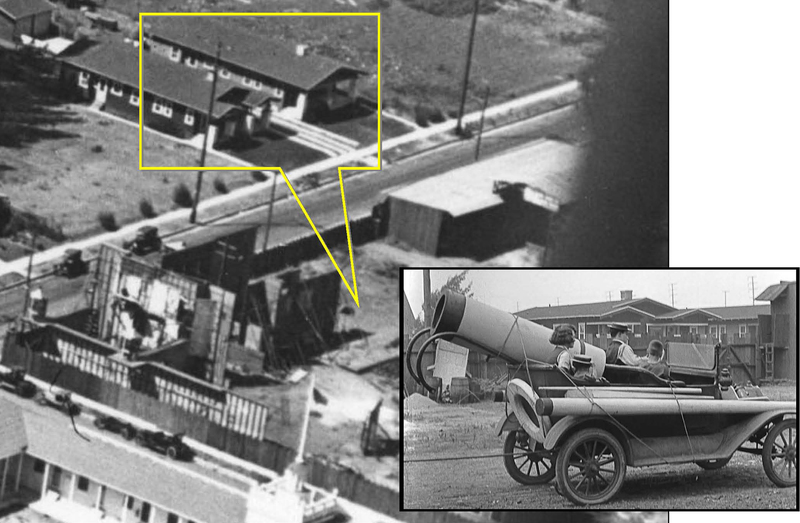 Buster also used the small vacant lot across the street from the studio (shown above) for many films including College (1927), where he built a dormitory set on the vacant lot. This vacant lot appears in many restored scenes from The Blacksmith (left), where in one shot (above) 1022 Cole appears again at back to the right. A closer view of the small corner backlot shows where Buster filmed this scene from The Boat. This even closer view shows the Convict 13 prison set, and the Neighbors tenement set. Note the 1022 address by the door. While Day Dreams marked the final onscreen appearance for the back of the Cole Avenue home, Buster saved the best for last when filming Sherlock Jr. (1924), where the front of 1022 Cole portrays his fiancé’s family home. The home appears in full view when Buster pays Kathryn McGuire a visit, and again in closer view when Buster, an amateur detective, ponders whether to shadow his rival up the street. The 1022 address appears clearly visible beside the door, and in faded numbers on the front step. Click to enlarge – 1022 Cole in real life (left) and in “reel” life from Sherlock Jr. HollywoodPhotographs.com. 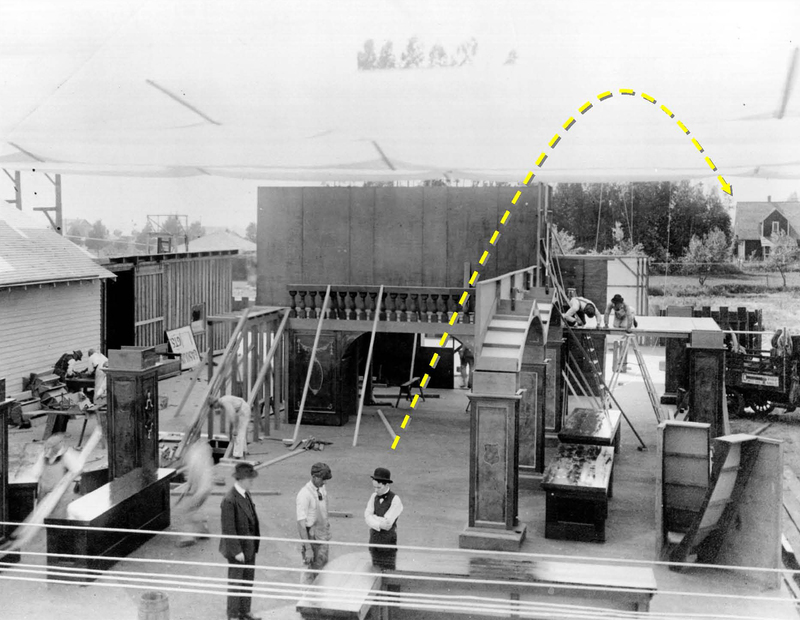 Geographically consistent, the following scene of Buster closely tracking Ward Crane’s every step and gesture was filmed looking east as they walk north from the home up Cole, providing a clear view of the Keaton Studio enclosed stage and corner barn, perhaps the only extant movie footage in which this historic studio appears. Looking east from Cole towards the Keaton Studio barn and enclosed shooting stage. HollywoodPhotographs.com. On a human note, I checked the city directories online at the LA Public Library, and found that Allen J. Henderson, a salesman, lived at 1022 Cole in 1916, while Edgar C. Beach, a ‘pumper’ lived there in 1917. Juanita D. Caplinger resided there in 1920, Louis J. Ramirez, a truck foreman, later salesman, lived there the longest, during 1921-1923, while Taylor E. Duncan, photographer lived there in 1924. Robert wrote to me that the 1920 census shows Juanita was the sister in law, along with several members of the Gilman family, all living at 1022 Cole. One of them, Frederick Gilman, is listed in the census as occupation “Actor,” and appears to be the gent listed here at IMDB. 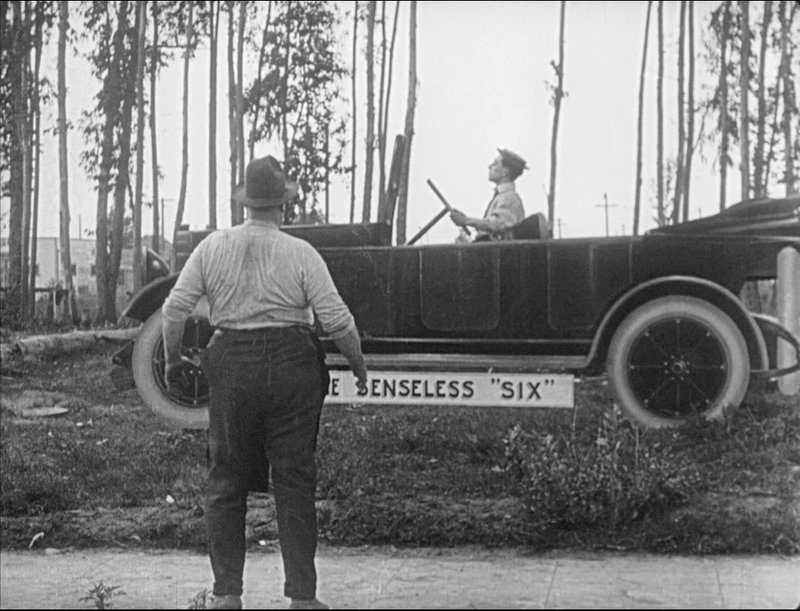 Frame images from Buster Keaton: The Shorts Collection 1917 – 1923 (C) 2016 Kino-Lorber, Lobster Films. This entry was posted in Buster Keaton, Charlie Chaplin, Daydreams, Sherlock Jr., The Blacksmith, The Boat and tagged Buster Keaton, Chaplin Locations, Charlie Chaplin, Day Dreams, Keaton Studio, Silent Comedians, Silent Comedies, Silent Movie Locations, Technicolor Building, The Blacksmith, The Boat, The Floorwalker, then and now. Bookmark the permalink. Allen J. Henderson, a salesman, lived there in 1916, while Edgar C. Beach, a ‘pumper’ lived there in 1917. Juanita D. Caplinger resided there in 1920, Louis J. Ramirez, a truck foreman, later salesman, lived there the longest, during 1921-1923, while Taylor E. Duncan, photographer lived there in 1924. Could this have been a boarding house? So many occupants.